Wayne Hennessey made seven saves against Newcastle United on Sunday. Manchester United shaved two points off Manchester City’s lead at the top of the Premier league after beating Huddersfield Town following City’s draw at Burnley. At the other end of the table, Southampton dealt a hammer blow to West Bromwich Albion’s survival hopes with victory at the Hawthorns. Meanwhile, Arsenal’s new signings lit up the Emirates Stadium with an emphatic win over Everton. Two or three goalkeepers made outstanding saves over the weekend but non kept the opposition out more often than the Welishman international. 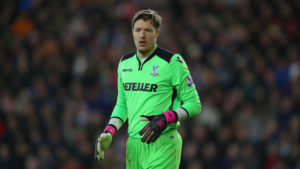 Against Newcastle on Sunday, Hennessey made seven saves in total as his team earned a vital point in their relegation battle at home to a rampant Magpie side who were clearly out to get three points off Palace. RB. Danilo Luiz da Silva(Man City). The Brazilian has for the huge part of the season been used as a bit part player with his manager Pep Guardiola preferring midfielder Fabian Delph at left back instead of the versatile former Real Madrid defender even when first choice Benjamin Mendy is out Injured. When Delph got injured, Guardiola still over looked Danilo and started young oleksandr-zinchenko and the Brazilian stayed put and come. When called up on, Danilo has always delievered like he did on Sunday against Burnely. 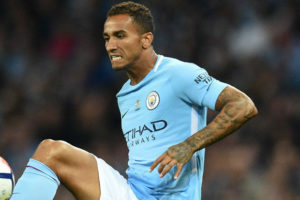 His ferocious strike which resulted into his second goal for the club may not have earned his team the points taht it deserved but will boost Danilo’s confidence a great deal as he also put up a solid perfomance overall. Another one who has not seen it easy playing week in week out for his side but when Jose Mourinho rang the changes after a poor display against Tottenham in mid week, Marcos Rojo was picked to start. Against Huddersfield, despite the fact that the Terriers did not pose any serious threat to United’s back line, Rojo was key to maintaining momentum for his side as he made a unmatched 94% pass completion ratio and played 88 passes overall with 36 of them coming in the opposition half. With such stats, the Argentine can surely feel he should be starting more games and his versatility as he can also play at left back can be of essence to my team. Burnely has stood out this season particularly for their defending and Ben Mee has not slowed down even in the absence of his preferred partner at centre back, James Tarkowski. When you play against Manchester City, they will attack you like no one else can in the Premier league and that is what happened on Sunday but Burnely’s captain on the day, Mee was a huge part of the reason why City failed to kill off the game resulting into that late Johann Berg Gudhmundsson equaliser. Mee who was again not playing with Tarkowski was impeachable in his own penalty area and also a menace when his team was attacking especially through his aerial abilities at set pieces. One of the most inconsistent performers in the Arsenal set up this season as the German international keeps on having one good and then bad game. Against Everton, despite not keeping a clean sheet for his team, he put in a brilliant shift that ensured his side returned to winning ways after a disappointing 2-1 loss at Swansea in the midweek. Mustafi was calm in possession, tackled brilliantly most notably making a last ditch recovery tackle to deny Walcott grabbing a return goal to the Emirates and capped his performance with a headed assist for centre half partner Laurent Koscielny. On course to grabbing his first league goal for Southampton against West Brom, the Gabonese midfielder showed the quality that saw him move to a top club like Juventus in 2015 with a host of suitors across England. He may not be at a top club anymore but at the Hawthorns, he recovered possession 10 times, more than any other player on the pitch, ran tirelessly and stood out amongst the crowd. When you watch him play for Southampton, one can’t help but wounder if he is playing at the wrong team. Still not fit enough as his manager suggested on Thursday, the Welshman grabbed his first Arsenal hat trick three days later in a display that maybe was over shadowed by new signings Henrikh Mkhitaryan and Pierre Emerick-Aubameyang hitting full gear. He is not one of Arsenal fans’ favourites but if he can be as clinical as he was against Everton converting all of his three shots on target, the opinion may change drastically. Three assists on you home league debut should clearly get you in any team of the week and i could not be an exception. The Armenian captain threaded a pin point accurate through ball to fellow signing Aubameyang on top of two other assists for Ramsey and could have even got onto the score sheet had his first half strike from out side the box hit the target. May be he was not used at United the way he should have been but we will have to wait and see what happens to his play as the season progresses. Man United fans got a test of the Alexis Sanchez that pushed Arsenal over the line in many games during his time at the Emirates. Ran all day, was fouled more often than any other player on the pitch, picked his self up, carried the team on his shoulders and then scored his first goal in a Manchester United shirt. Jose Mourinho will surely be proud that he now has the Chilean worrier in his ranks and more performances like the one against Huddersfield will surely come more frequently. 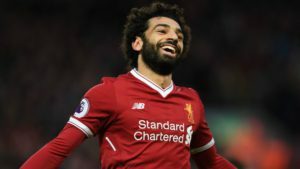 The Egyptian Messi like he is known in his mother land, Salah has taken the league by storm and continues to silence his doubters by the day. Against Spurs, he scored two more goals to take his tally to 21 for the season, one behind top scorer Harry Kane. The second was one that even the real Messi would be proud of as he dribbled past three defenders and slotted the past the on rushing Hugo Lloris. Muhammed Salah has now scored 21 league goals in 25 games. What a team performance from Brighton but non of their players stood out for me like the 25 year old Colombian attacker. Kept running at West Ham’s defence, tracked back well and grabbed his third goal of the season with with a strike that surely deserves to win a game. Brighton have struggled to score goals all season and their manager Chris Hughton will hope Izquierdo can score more often than he has been doing in the past. The Englishman become only the fourth manager this season to avoid defeat against Manchester City in the league and how to do it with a late equaliser. He organised his team well and they worked hard for each other all day long. Dyche will hope that the performance against the league leaders can spur his team on as they continue their push for a Europa league appearance.